What would you do if the government wanted to force you out of your home? Would you scurry away in defeat, or would you stand up and fight? Tanya Washington, a Harvard-educated professor at Georgia State University College of Law, chose to fight back. She boldly marched to Atlanta’s City Hall to testify in front of the city council members who authorized eminent domain proceedings that could leave her homeless. “I live in a beautiful working-class neighborhood. There was flooding in my community in Peoplestown. It only affected half of my street, so my house was fine. Still, the city council and the mayor used this as an excuse to say, ‘We need your house,’” Washington said. Eminent domain is the right of a government or its agent to seize private property for public use. Homes all over the country are being seized with eminent domain as the justification. There are times when this is necessary; for example, when crumbling infrastructure makes a place unsafe to live. Some home defenders don’t believe this is the only reason eminent domain proceedings occur. People like Tanya Washington believe that it often has more to do with race, class, and gentrification. “After a three-year battle where I was resisting the mayor and the city of Atlanta, they are trying to take my home. I discovered that after the Atlanta Braves left Turner Field and moved north there were lots of plans for developing the area I live in. They wanted us out so they could move forward with their plans for our block. There were twenty-eight of us living here, and there are five left. When I learned what the city planned to do, I educated myself about how this is happening in cities all over the United States. I want people to know that just because you’re threatened with eminent domain, it doesn’t mean you have no rights,” Washington said. According to Washington, even the city’s own developers have said that there is a way to address the flooding without displacing homeowners. However, the city wants to make way for new development, so that option was ignored. No thought was given to the homeowners who have raised families and made memories in the houses that the city plans to take away. City Hall needs more diverse representation to stop the government from rendering homeless the very citizens it is supposed to protect. To end this practice, people must respond with resistance, litigation, and more diversity among elected officials. Only when there are more women, people of color, and LGBTQ voices in politics will everyone’s needs be heard and their rights respected. Educating people about housing laws and bringing attention to the alarming trend of citizen displacement is just one aspect of Tanya Washington’s mission to champion the people. She’s a brilliant educator and influencer who used her voice to reach others at the Women’s March in Atlanta. 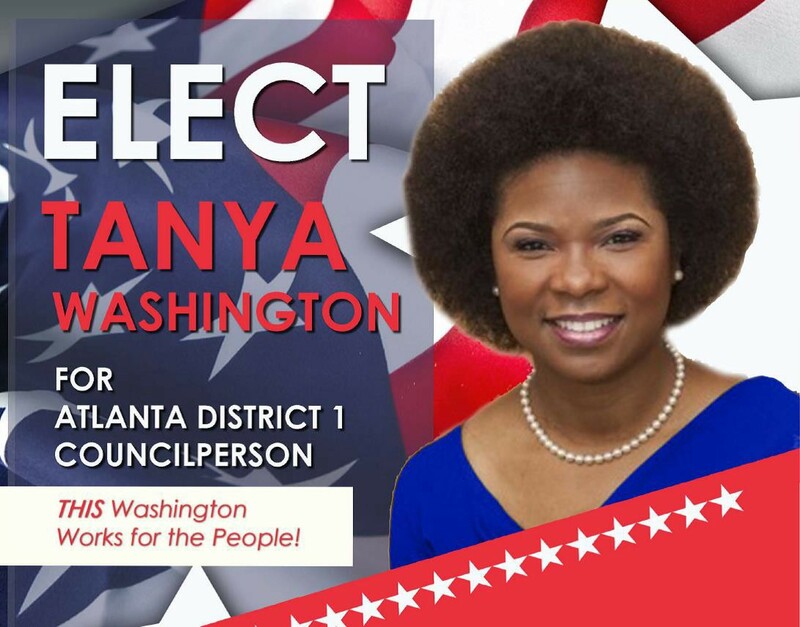 Fear not, Tanya Washington will be fighting beside you. Viva la resistance.